[Eclipse] is an open-source Integrated Development Environment (IDE) widely used for Java development, but with an extensible plugin system that allows to customize it for other languages and usages. many other tools such as debugging, code formatting, showing call hierarchies etc. The purpose of the is page is to document how to set-up Eclipse for developing AVR software, and working on the QMK code base. Note that this set-up has been tested on Ubuntu 16.04 only for the moment. Before starting, you must have followed the Getting Started section corresponding to your system. In particular, you must have been able to build the firmware with the make command. Eclipse is a Java application, so you will need to install Java 8 or more recent to be able to run it. You may choose between the JRE or the JDK, the latter being useful if you intend to do Java development. Eclipse comes in several flavours depending on the target usage that you will have. There is no package comprising the AVR stack, so we will need to start from Eclipse CDT (C/C++ Development Tooling) and install the necessary plugins. If you already have Eclipse CDT on your system, you can skip this step. However it is advised to keep it up-to-date for better support. If you have another Eclipse package installed, it is normally possible to install the CDT plugin over it. However it is probably better to reinstall it from scratch to keep it light and avoid the clutter of tools that you don't need for the projects you will be working on. Installation is very simple: follow the 5 Steps to Install Eclipse, and choose Eclipse IDE for C/C++ Developers at Step 3. Alternatively, you can also directly download Eclipse IDE for C/C++ Developers (direct link to current version) and extract the package to the location of your choice (this creates an eclipse folder). When you are prompted with the Workspace Selector, select a directory that will hold Eclipse metadata and usually your projects. Do not select the qmk_firmware directory, this will be the project directory. Select the parent folder instead, or another (preferably empty) folder of your choice (the default is fine if you do not use it yet). Once started, click the Workbench button at the top right to switch to the workbench view (there is a also checkbox at the bottom to skip the welcome screen at startup). Note: you do not need to restart Eclipse after installing each plugin. Simply restart once all plugins are installed. This is the most important plugin as it will allow Eclipse to understand AVR C code. Follow the instructions for using the update site, and agree with the security warning for unsigned content. 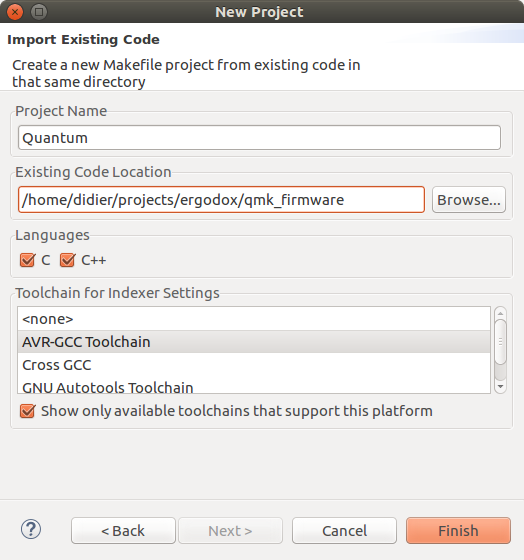 This plugin is necessary to properly display the colored build output generated by the QMK makefile. Follow the instructions and agree again with the security warning for unsigned content. Once both plugins are installed, restart Eclipse as prompted. The project will now be loaded and indexed. Its files can be browsed easily through the Project Explorer on the left. ¹ There might be issues for importing the project with a custom name. If it does not work properly, try leaving the default project name (i.e. the name of the directory, probably qmk_firmware). We will now configure a make target that cleans the project and builds the keymap of your choice. Leave the other options checked and click OK. Your make target will now appear under the selected keyboard. (Optional) Toggle the Hide Empty Folders icon button above the targets tree to only show your build target. Double-click the build target you created to trigger a build. Select the Console view at the bottom to view the running build.